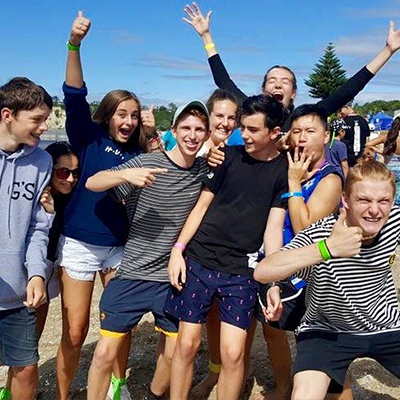 St George’s Youth is a Christian youth group for Year 7-13 students. It is led by a committed team of youth leaders who are themselves committed to growing in their relationship with Christ and in fellowship with each other. Our aim is to create a culture of authenticity, a place where the young people can truly express themselves without shame or fear of judgement. We want to encourage faith that is genuine. If you are a member of our youth group, you can join the St G’s Youth Facebook page. Every Sunday morning during term time, the youth separate from the main service after the opening worship and meet in the Youth Space under the church hall. After welcoming everyone we tend to gather for a whole group Bible discussion, then split into groups. Each group is led by two leaders for about 45 minutes. We then re-join the service for Communion. Our weekly, Friday night event is hosted by Wilson Chan and a team of awesome leaders. These events involve a whole lot of fun ‘n’ games and provide a relaxed space for students to chill out with friends. Anglican Youth Ministries (AYM) holds a number of events for youth throughout the year. We advertise these events at St G’s and encourage our youth to attend, as they are a great way to meet youth from around the Auckland region. The youth band meets together weekly for practices and has the opportunity to lead sung worship in the main Sunday service every few months.